Failure to replace a timing belt in due time can lead to costly engine damage. Diesel engines engines XUD (not HDI): 80 000 km or 4 years. V6 ES9J4 and ES9J4S: 120 000 km or 6 years. V6 ES9JA: 180 000 km or 9 years. What is the funcion of the timing belt? The timing belt is the driving link between the crankshaft and the camshaft. Its primary function is to operate the engine's valves via the camshaft. It can fulfil additional functions like driving the coolant pump as in the case of the Peugeot EWT10J4 engine shown on the left. Why does the belt break? If you like to take your car to a racetrack on a Sunday afternoon to do fast laps then you should consider an early belt replacement; Unless you are prepared to take the risk of the damage bill. What Happens When The Belt Fails? The most common scenario when a belt snaps will be that the pistons hit and bend several valves, usually the connecting rods and pistons will survive. The moment the belt breaks, the camshaft will stop turning almost immediately while the crankshaft will keep going under its own inertia or it can be pushed along by the movement of the vehicle in the case of a manual car. It doesn't always take a broken belt to bend valves. A worn and loose belt can jump a few teeth, which will allow the camshaft to keep on turning. The engine will loose power immediately as the valve train now is out of timing. 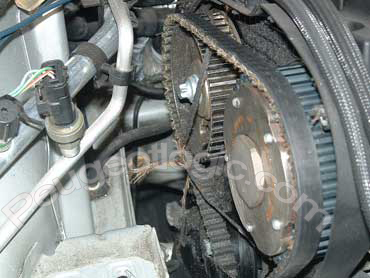 Again, the damage is done by the engine's or the vehicle's inertia and is usually worse than with a broken belt. With a broken belt it is possible that the majority of the valves remain closed and therefore are protected from the advancing pistons. In the second case however, once one lot of valves is bent the next lot gets forced open and bent until the job is completed. On the other hand it is possible for a belt to jump out of timing without interfering with a single valve. We had one vehicle arrive on a tow truck with no start, no compression. All that was needed was a new timing belt to make the lion purr again. Very few people are ever that lucky. How about the pump and pulleys? The water pump, the tension and idler pulleys need to be inspected every time the timing belt is replaced. Seizure of a bearing will lead to almost instant belt failure. There is no need however to categorically replace all of these parts during belt replacement. The timing belt looks as if disaster was about to strike. The owner of this vehicle was lucky. He could hear a noise from the engine and had it checked. ½ of the belt had worn away and the remaining part of the timing belt started to run off the camshaft sprockets. In this case the problem was not caused by neglect but by a faulty timing belt tension roller. We believe the above information to be true and correct for the Australian market. Different recommendations may apply in other countries. Always refer to your Peugeot Dealer before making a decision about servicing your vehicle.